We are interested in young children’s first language acquisition and language processing. 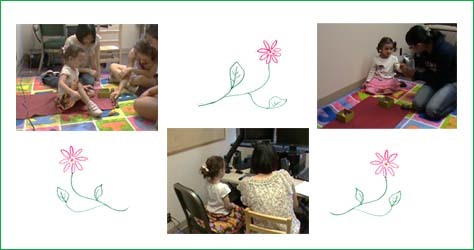 In particular, our lab investigates how children acquire and use the knowledge of meaning. We assess children’s semantic knowledge and processing by utilizing behavioral tasks, including various linguistic comprehension tasks and cognitive tasks. We also adopt the visual-world eye tracking paradigm, with an eye-tracking system designed specifically for children’s participation. We actively collaborate with members of the Second Language Acquisition Lab and the Neurolinguistics and Language Processing Lab. We have a weekly joint lab meeting, Research in Acquisition and Processing (RAP), in which members of the three labs informally discuss research progress and exchange research interests with each other. Linguistic comprehension tasks measure how participants interpret linguistic expressions (e.g., sentences). For child participants, tasks are designed in an entertaining format, such as ‘story-games’, where children are presented short stories in (i) pictures administered by the software Paradigm (Perception Research Systems) on the computer screen or (ii) act-outs using toys and props, and are asked to judge whether the meaning of given sentences match the content of the pictures/stories. Often, there is a character puppet who watches the stories along with the children. One format of the story-games is that, after each story, the puppet describes what he thinks happened in the story. The child is asked to determine whether the puppet’s description was right or wrong based on what really happened in the story. Cognitive tasks measure children’s development of non-linguistic cognitive abilities, such as executive function (a set of cognitive abilities involved in executing actions, learning, decision making, perspective switch etc.) and Theory of Mind (the ability to take the others' viewpoint). The development of this cognitive domain may be highly related to the development of children’s first language. We combine cognitive tasks with linguistic comprehension tasks in our projects in order to investigate how the language development might be associated with the development of non-linguistic cognitive abilities. These tasks typically include question-after-story paradigm and card sorting tasks. Our lab houses EyeLink1000 (SR Research), an eye-tracking system that is designed in a friendly format for children’s participation. The system is free of any electronic devices that the participants need to wear on their heads, except for a small adhesive sticker placed on their forehead for the eye-tracking system to sense where the head is positioned. This remote system accommodates young children’s participation without limiting their body movements too much or placing a weight on their head. We adopt the visual-world eye tracking paradigm. Typically in this paradigm, participants listen to recorded linguistic expressions and see visual scenes associated with the meaning of linguistic expressions. The eye-tracking methodology allows us to examine when and how often participants look at various parts of the visual scenes while they are listening to the sentence and processing its meaning.